Did you know that the majority of commercial buildings like restaurants, retail malls, banks, and office buildings are heated and cooled by roof-top units (RTU)? WS Electric & Air Conditioning, Inc. installs, services, and maintains packaged roof top air-conditioning units for many of the commercial buildings throughout North Alabama. We have relationships with the industry’s most trusted manufacturers which allow us to recommend the most innovative energy-efficient units available on today’s market. Payback period of your initial investment is important when choosing a new RTU for your commercial building. WS will work with building owners and facilities managers to select a new RTU that helps reduce your overall operating costs, is properly engineered to meet the requirements of your building, and at a reasonable price. 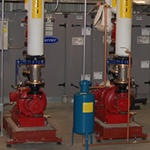 RTU’s are the most effective way of providing the heating and cooling needs of many commercial and industrial buildings. Choosing the right RTU is critical, whether it is built for a new building or installed to replace an existing system. You can rest assured that the RTU we choose will accommodate your needs by delivering outstanding comfort to your building’s occupants, help your business control energy expenses, and provide exceptional indoor air quality. At WS Electric & HVAC we are well-qualified in both the installation and repair of RTUs. Our experience installing or replacing hundreds of RTU’s has allowed us to develop methods which enable us to perform this work in a quality manner. Click HERE to see the kind of quality installation you can expect from WS!